“See this guy right here? His name is Kahlief. 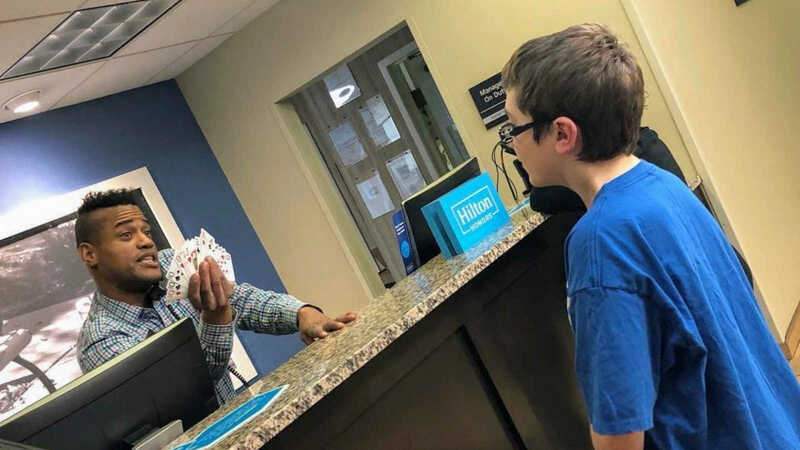 At some point in time on Friday night, while working at the front desk at the Hampton Inn, Kahlief looked up to find a random kid standing in front of him asking if he’d like to see a card trick. Let me tell you all the stuff Kahlief didn’t know. He didn’t know that this little boy has autism. That learning and doing card tricks is a passion of his because it helps to quiet and focus his brain as well as keep his hands busy. He didn’t know that this little boy lost his dad a few years ago, has been on the waiting list for a ‘big brother’ for well over two years now, and lives with only his mom and sister, so very much misses interacting with male figures. Kahlief didn’t know any of that, and was still kind enough to say ‘yes’. He very easily could have told Colin he was busy, or to come back later, or any number of things, but he didn’t. He allowed Colin to hang out at the desk with him for what felt like forever, watching Colin do card tricks and then showing Colin some tricks that he knew as well. He paused when he needed to, when the phone rang or a customer came in, (in the pic he is on the phone, the person he was speaking to had him on hold), but he never once made Colin feel like he was a nuisance or a burden. 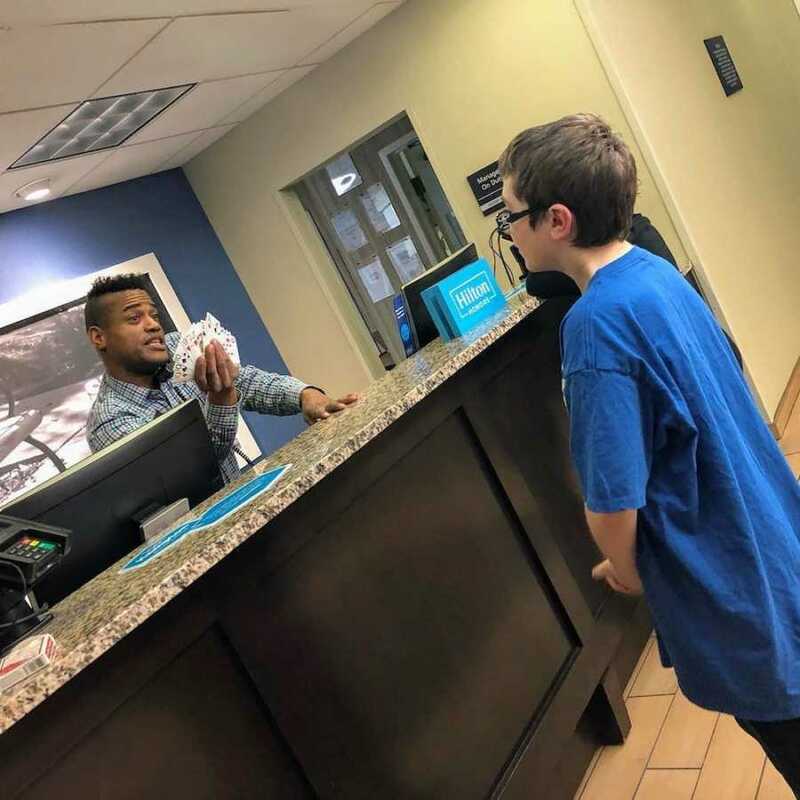 In fact, when we saw that he had returned for another shift the following day, he made it a point to let Colin know he was geared up and ready to go with more card tricks. So, this kind man took time out of his day again on Saturday, still not realizing what a huge impact he was having on Colin, because he was still completely unaware of all the things about Colin he did not know. This story was written by Megan Griffin Haas. The article originally appeared here. Submit your own story here, and subscribe to our best stories in our free newsletter here.